Located very close to Colombo city’s international airport, the Negombo Beach is a pleasant place to spend a few hours relaxing and resting. Visitors often complain of garbage laying around the beach, along with muddy brown water lapping onto the shore. 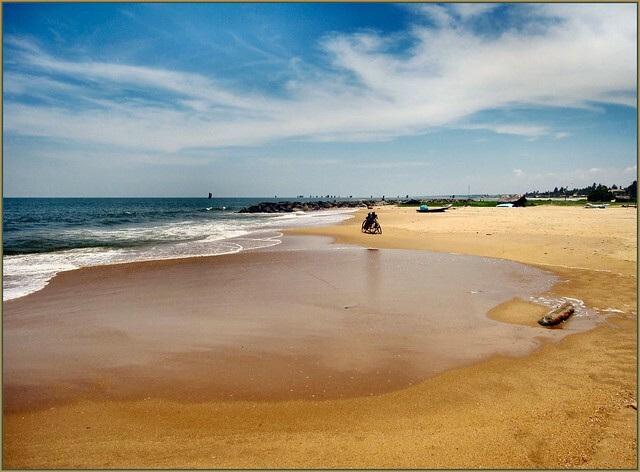 Compared to the pristine southern beaches of Sri Lanka, the Negombo beach fails to impress many tourists. Negombo beach stretches across the north region, lined up with palm trees and is not as famous as the beaches of the south. Many accommodations are available near the beach and all the water sport activities are also available. There is a Negombo beach park nearby. Enjoy the beautiful subsets sitting in this park. Sun bathing chairs are not available, hence, one must make their own arrangements for mats and umbrellas. Few hawkers consistently persuade tourists to buy their products, and leave them in an irritable state of mind. To splash around, the water is fine and cool, but one cannot venture out to deep into the sea. Many budget hotels and cafes line the shore, which offer cost-friendly services. Therefore, the beach can barely keep up with its competitors, but is yet a suitable place to spend a few hours having fun in the sun. Due to its location on the Western coast of Sri Lanka, the sunset view is absolutely mesmerizing! Perhaps, one can enjoy a lovely little stroll along the beach during the cooler dusk hours.